Since moving to Minneapolis seven years ago, Guante has established himself as one of the sharpest, smartest and most consistently unique voices in the saturated Twin Cities hip hop scene. Now, after six albums, two National Poetry Slam championships, over a million YouTube views, three appearances on Upworthy, and performances at the Soundset Festival, First Ave. Mainroom, Hope Rocks gala, and a hundred other concerts, rallies, benefits, school assemblies and colleges, Guante is looking back in order to look ahead. A LOVE SONG, A DEATH RATTLE, A BATTLE CRY is the capstone on the first phase of his career. Featuring brand new songs, exclusive remixes, a handful of spoken-word poems and a curated selection of the best songs Guante has made, this mix is the perfect introduction to his distinct blend of progressive politics, gallows humor, and storytelling prowess. Stirring, focused calls to action flow into achingly bittersweet love songs flow into meditations on working class identity and much more, through metaphorical lenses as diverse as superheroes, motherhood, graffiti, zombies and getting struck by lightning (literally). Guest appearances include Chastity Brown, deM atlas, Kristoff Krane, Claire de Lune, and Lydia Liza (not to mention a brief appearance from Haley Bonar). There isn’t a lot of “conscious” rap this honest and down-to-earth, nor a lot of “alternative” rap this well-crafted and creative, nor a lot of “political” rap this focused and specific. That’s what the title of the project is all about—creating work that functions on all three levels: human, creative, meaningful. Connected to real emotions, a little bit weird, always seeking to build something. A love song, a death rattle, a battle cry. The mix is available now, for free. 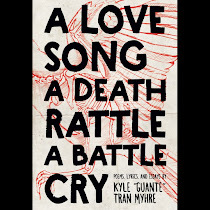 It is both the companion piece and opening act for Guante’s book (of the same name), coming soon. For more information, see www.guante.info. even when you know it’s poison, yo: you feelin’ well? Like a body that’s so hungry it begins to eat itself?